A Northern Ireland actor who went from busking to the big screen, becoming a Hollywood star, will be honoured tomorrow. 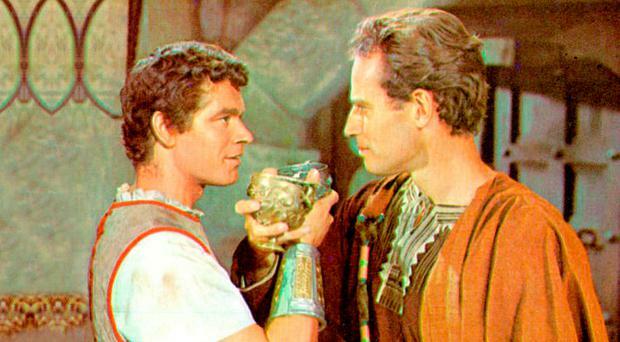 Stephen Boyd’s own life story reads like something from the movies. Born Billy Millar, the actor from Glengormley in Co Antrim was propelled to international fame after a chance encounter with Sir Michael Redgrave while working as a doorman in a London cinema. He went on to feature in films such as the Biblical epic Ben-Hur, and starred alongside leading actresses including Zsa Zsa Gabor, Sophia Loren and Brigitte Bardot. Now, his remarkable career will be celebrated with the awarding of a blue plaque in his memory by the Ulster History Circle. The plaque will be unveiled tomorrow at ‘Moygara’ on the Shore Road at Whitehouse, near Newtownabbey. Chris Spurr, the chairman of the Ulster History Circle, said: “Stephen Boyd was born in Whitehouse across the Lough from Holywood, Co Down, but he set his sights on Hollywood, California, from where he achieved worldwide fame, starring in many movies. Boyd was born in a house, long demolished, at the corner of the Doagh Road near Whitehouse on July 4, 1931, before relocating with his family to Glengormley. He left school aged 14 to study shorthand typing and bookkeeping at Hughes Commercial in Belfast. But he stood out with his film star looks, and by late 1948 his wanderlust had led him to Canada and the United States, where he performed on radio with a touring theatre company. Boyd returned home and graduated from the local Carnmoney Drama Group to the Ulster Players at the Group Theatre. There, writer and actor Joseph Tomelty gave him the role of the gravel-voiced policeman in the popular radio series, The McCooeys. In 1951 he travelled to London as an understudy with the Ulster Players for a performance as part of the Festival of Britain. His attempts at acting glory suffered setbacks, and he was forced to spend some nights on a park bench, even busking outside the cinema. Then his career received a lucky break when he landed a job as a cinema commissionaire in Leicester Square. There he met Sir Michael Redgrave who arranged a contract with London Films, later to become part of 20th Century Fox in Hollywood. By 1954 the young man from Whitehouse and Glengormley, who had always dreamed of becoming a star, had made his first Hollywood movie, Lilacs in the Spring, with Zsa Zsa Gabor and Anna Neagle. But his biggest break came in the role of a Nazi spy in the 1956 production of The Man Who Never Was. He became more and more noticed for his looks as well as his acting, and the following year he was auditioning along with famous names such as Victor Mature, Stewart Grainger and Kirk Douglas for the part of Messala in William Wyler’s 1959 MGM epic, Ben-Hur. He landed the part, and the role catapulted him to international stardom. He won a Golden Globe for Best Supporting Actor and was being hailed as ‘The New Gable’. He went on to be a key figure in films such as The Fall of the Roman Empire and Genghis Khan. But life in the limelight was not without its complications. Boyd carried scars as a legacy of Ben-Hur’s famous chariot race. Then, in 1961, whilst filming Darryl Zanuck’s The Big Sleep, he twice almost lost his life. Despite a Hollywood career spanning almost three decades and some 60 movies, he never forgot his roots and returned to Glengormley to his parents’ house as often as he could; many times resting there after filming in Europe. He purchased a new bungalow for his parents, James and Martha, in Bangor, Co Down, and they named it Messala after their son’s most famous role, in Ben-Hur. Boyd married twice in California including, in 1975, his long time girlfriend and secretary, Elizabeth Mills. But two years later, on June 2, 1977, he collapsed and died of a heart attack while playing golf in the San Fernando Valley. He was just 46. He is buried in Oakwood Cemetery, Los Angeles, amidst other Hollywood greats such as Fred Astaire and Ginger Rodgers. Boyd is also remembered on his parents’ grave in Clandeboye Cemetery, Bangor. Tomorrow, he will be honoured by the Ulster History Circle, a charity which erects blue plaques in public places across the nine counties of Ulster to celebrate people of achievement. A person of note is not considered for a blue plaque unless they have been dead for at least 20 years, or would have reached their 100th birthday.